For many years, Barbara has devoted herself to her passion for all aspects of early dance. Inspirational dancer, teacher and historian of many periods of historical dance, Barbara is a living embodiment of the power of dance. 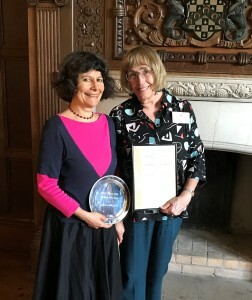 A founder member of the Early Dance Circle, Barbara has worked steadily since then to further its aims for early dance, acting as Membership Secretary, Conference Organiser (and Editor of its Proceedings) and very often running its annual Festivals as well. Her regular classes in London, and elsewhere, attract a dedicated following and as Director of The Chalemie School of Baroque Dance, Early Music, Costume & Commedia, she (with Bill) has created an immersive experience that has led many to early dance and music theatre, particularly of the 18th century. As a baroque dancer of outstanding sensitivity and musicality, Barbara is quietly famous. She has performed and taught throughout Europe, the Baltic States, Russia, the USA and Australia. She trains singers in baroque gesture, has toured for many organisations and has frequently taught early dance to degree students in the UK. Each summer, she teaches and performs in Krakow at their long-running Festival of Court Dance. Barbara regularly appears at Conferences and has published many articles on aspects of early dance. with Peggy Dixon and studied at Morley College under Wendy Hilton. She was part of the exciting early music developments of the 70’s, working with James Tyler and Anthony Rooley in the establishment of the Consort of Musicke, and the founding of the journal Early Music in 1973. She was on the original committee of the National Early Music Association with Nicholas Kenyon, Trevor Pinnock and Christopher Page. Madeleine was Professor of Dance History at the Guildhall School of Music and from there took her expertise to many schools abroad. Her publications include work on 15th and 16th century Burgundy and Italy, the minuet and country dance. She is currently the President of the European Association of Dance Historians. A founder-member of the EDC, Anne has completed a doctoral thesis on the Stuart Masque. She lectures and publishes widely on 16th to 19th century dance and has taught at many learned institutions, including the Trinity Laban Conservatoire of Music and Dance. Regularly consulted in connection with a range of media dance projects, Anne was formerly the long-serving Chair of the Dolmetsch Historical Dance Society and is now its Director of Education & Research, under its new name of The Historical Dance Society. Diana brought her vast music and drama skills to early dance through her group Rostibolli Renaissance Dance, who performed frequently at the Festival and annually at the Leicester Early Music Festival. Her research on 15th century dance, and later periods as well, has resulted in a number of publications and conference papers. Additionally, over the years she has undertaken huge administrative responsibilities, first as Secretary of DHDS and then as Chair of the EDC for nine years. Junella came to early dance through Nonsuch via early music, and was for several years Joint Director of the Nonsuch Summer School. She founded Blind Dance which ran for 17 years, bringing the group to the EDC Festival on three occasions, as well as hosting a four-day Festival in Edinburgh. Together with Peggy and her son Angus, she was responsible for the 9 books and tapes of Dances from the Courts of Europe. More recently, she has edited The Arbeau Branles by Peggy Dixon with full instructions and music for 20 dances. Ellis Rogers had just published his magnum opus The Quadrille and, when a copy was presented to our Patron Dame Beryl Grey, she in turn presented the Peggy Dixon Trophy to the Rogers. Chris and Ellis have hosted the Early Dance Festival at Bromley twice. Their popular Quadrille Club in London has just celebrated its 30th anniversary. As a couple, they have contributed hugely to our understanding and enjoyment of 19th century dance. On retiring, David fully embraced early dance, particularly the Basse Dance, his monograph on which was completed shortly before his death. David created the National Resource Centre for Early Dance, cataloguing its 900-odd items and leaving it to the care of the Early Dance Circle. It has now moved to its new home at Kellogg College, Oxford University. We are grateful for the energy and scholarship that resulted in David’s many publications (most available through the EDC). He was a founder member of the Capriol Dancers of Cambridge, who have hosted the EDC Festival twice. Who was Peggy Dixon (1921-2005)?